Belly Dance Tribute 12/29/11: Signature Moves/Dances: Have you noticed that some dancers have awesome Signature Moves? For example, I remember learning the Basic Beledi step from Bert Balladine many years ago and I love it so much I use it in a lot of choreographies. Amaya does this fancy turn step with her arms. When I see her do that turn, it speaks “Amaya Dance Talk.” Check out the YouTube video clip of Amaya and look at about 20 seconds into the dance when she does the turn. (Amaya, what is the name that fancy turn you got going on girlfriend? Whenever I watch Amaya dance, I want to take more lessons with her again.) I remember learning the Hip Down Shimmy from Mahmoud Reda back in the early 1980s, which I nicknamed Reda Shimmy (or maybe that’s name of the shimmy). When I learned Saidi from Lala Hakim, she taught a move with our hands waving in the air whilst we are traveling back, to remember this step, I nicknamed it the Mickey Mouse move. With Neon of New York, NY what I love best is her Smile! I know that sounds goofy, considering she can balance that tray of candles while wearing a cape like nobody’s business. But when I put on the Love Potion DVD, I love to do that one on a Monday night because her smile lights up the room, it cheers me up and gets me in a great mood to dance. I talked about “phoning in” a dance show, but I think Neon’s smile is very genuine and bright. As a performer our mood can affect the audience’s mood and we are not just merely executing dance movements, we projecting attitude and emotions as well. With Suhaila Salimpour, she will forever be the person I feel that introduced locks, pops and drops. There are some great dancers doing that today, but I remember Suhaila teaching that in dance seminars 20 or so years ago. She was the innovator of those moves and also the squeezing gluts, which she demonstrated so well as a guest artist on the Ellen DeGeneres show. Let’s talk Signature Dances! With Amaya, I love seeing her dance to Amayaguena by the Trans Arabian Sound Band, especially when she wears the costume with the hat and pants. It is so authentic and her spirit changes on that dance, in my opinion. That music was created for her, so it seems to be a very deep, personal experience when I watch her perform to it. 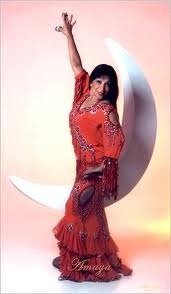 I love watching Nagwa Fouad perform to Samara by Setrek Sarkissian. Especially the version when she is carried out and is posing with the fan. 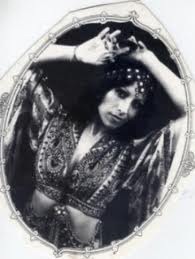 You go Belly Dance Queen of Egypt Nagwa, the Princess of Cairo! Do you have a favorite dance, that might be your “go to” dance or, just one that you love the costume, music or choreography for? Mine used to Sahara City (not sure if name is correct); I got the music tape from Lala Hakim after attending her weekend workshop. When I did the choreography, I used a lot of the steps learned from Lala Hakim. I thought of that routine as my signature dance for quite some time, before moving on to the next favorite dance. A Signature Dance, is one where dance movements, steps, costume and/or choreography all meet to make a perfect fit for the dance. Another favorite Signature Dance was to “Souk el Jawaree” because the music sounds like ancient Egyptian Pharonic style, so I had a costume made to match the music and used steps that I felt matched the music as well. This dance looks great with one of my large capes, especially the ones that are pleated. I have the large Gold cape that I use as well as a Multi-Color cape that is pleated with large sequin palettes. Please post a comment to let us know your favorite Signature Dance or Signature Move. Thanks. I believe this site holds very excellent indited content blog posts.